Dialog – The Institute for Intercultural Meetings was founded in 1993. It is an independent educational institute for youth and adults. Hanna Tidhar, the general director, works in the field of building intercultural bridges and relations since numerous of years. As a Holocaust survivor the work at the Dialog-Institute has become her task of life. In cooperation with German friends and colleagues the Dialog-Institute founded in the 90th numerous youth exchange projects. The team of the Dialog-Institute consists of the German born historian Michael Schwennen, freelancers, guides, workshop tutors, representatives of the different groups of the Israeli society, of religious congregations, of political parties, witnesses of history. The projects of the Dialog-Institute have a wide range. They are for example conducted with choirs, orchestras, youth in danger, pensioners, soccer fans and others. The institute has a nearly 20 year long experience in conducting socio-political seminars and excursions in Israel. The programs are topic focused and tailor made according to the requests and interests of the participating institutions, organizations and partners. 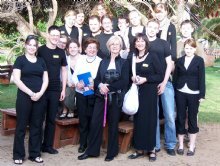 In 2011 the Dialog-Institute started to conduct youth-exchange-projects with Poland under the auspices of the Public Israeli Youth Exchange Council. Two Israeli delegations will visit Poland this year and two Polish delegations will also come this year to Israel. The Dialog-Institute conducts approximately 30 exchange projects and around 10 seminars and excursions per year. In addition we conduct also during the year 3 seminars for German volunteers in social projects in Israel and the Palestinian Autonomy.